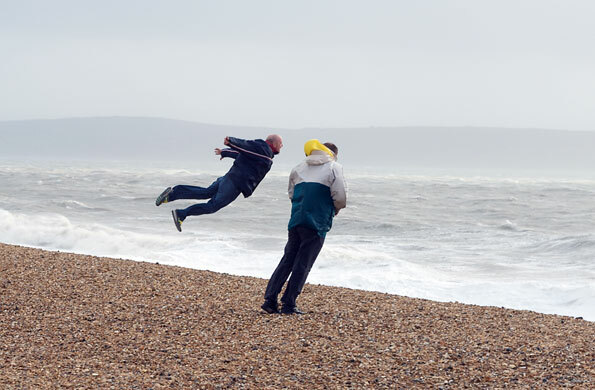 I couldn't resist this photo of a man blown off his feet by high winds on the British coast. not to be a gloomy gus about things (i really like this blog), but the prose style is getting a bit out of hand, no? if you look back through older posts you see that the author weirdly drops into italics every time he thinks he's saying something profound, and all the faux-scifi-novelist questions that abound after every observation really pull focus away from the true strengths of this blog--namely, the links and resources it encourages readers to follow out on their own. it wouldn't be worth pointing out all this if this blog didn't have so much potential. in that sense, this post is simply to say thanks. it's just becoming frustrating, for this reader at least, to have to wade through so much of the "please pay attention to me please" & the "do you think i'm as smart as i think i am" rhetoric. how about the same solid information without all the wannabe NPR aw-shucks aesthetic? the last thing architectural criticism needs is more mild & vague bloviating. again, though, thanks for the great blog. nneg - This blog has always been about the architectural conjecturing (ie the content created "in-house"), in fact I would argue links/resources take a backseat to the "stories". In reality it is half and half. In any case if you're here for the links to other blogs and organizations and what-have-yous then no one is stopping you. Also, I had to look up "bloviating" which I think defeats the purpose of using the word "bloviating" in this case.